Glenavon's Andrew Mitchell. Pic by INPHO. Mitchell joined the domestic game’s 100 Club with a landmark finish in the recent league victory over Newry City AFC. With his header having promoted the former Dungannon Swifts forward on to the century scoring charts, Hamilton now wants Mitchell to push on and cement his promise into an even greater end product. The 25-year-old striker has struggled for consistency in front of the net this season and the Newry winner proved Mitchell’s first senior goal of 2019. 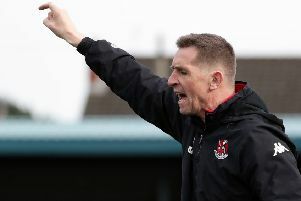 Hamilton moved into management after a playing career as one of the Irish League’s most feared forwards and is backing Mitchell to now build on his past progress towards hitting future heights. “It is a great achievement for Andrew and, overall, he was unplayable against Newry with a complete performance,” said Hamilton. “But Andrew’s attributes scare teams and opponents are always wary when he’s playing, which is a mark of a top striker. “I don’t know if hitting 100 goals was on his mind during the recent run without scoring, I know that has happened to players in the past in similar situations when they try too hard. “As a former striker I’m well aware how every forward has periods when nothing seems to go in but, as with anyone, we encourage the player to keep on doing his job and trusting in that work. “It can be a lonely game at times and I do feel Andrew sometimes suffers as a Glenavon fan. “Again, thinking back to my career, there is greater expectation on someone playing for the club he supports and even on a local compared to someone signed from a different league. “But that is all part and parcel of the game and we want Andrew to show greater self-belief at times. Glenavon and Mitchell line out this weekend at home to Crusaders in the first post-split Danske Bank Premiership game.